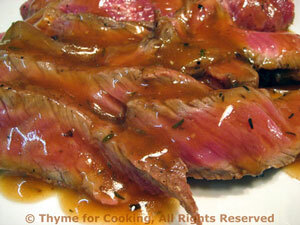 Thyme for Cooking Menus: Grilled Sirloin Steak Madeira, easy recipes. The Potato and Chard Gratin is one of those dishes that looks a bit of a mess at first.... Have faith, it all comes together. This makes a great dinner party dish: Use a larger, cheaper cut of meat, about 1 1/2" (4cm) thick, and marinate 8 - 12 hours. The rest of the ingredients can be doubled (I actually 'halved' everything for this version for 2) You can also make more and serve the leftovers with pasta. Put steak in a deep dish - a baking dish or roasting pan works well. Mix all ingredients for marinade and pour over steak. Let marinate at room temperature for 30 minutes or refrigerate 3 - 5 hours (up to 24 for less tender cuts). Remove from marinade, reserving 1/4 cup marinade. Cook on barbecue grill over direct heat for 4 - 6 minutes per side, basting occasionally - or until done - 140 F for rare. 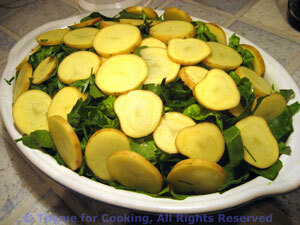 Use thumb test, meat thermometer or by slicing into center and looking. When done, remove from heat and let rest for 5 minutes. In small saucepan bring marinade, stock and Madeira to boil. Add half of the cornstarch mixture slowly and stir until thickened. Add the remaining half slowly if you would like the sauce thicker. 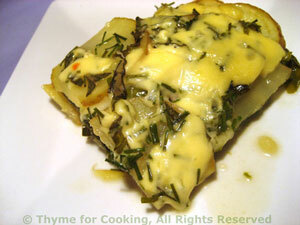 Slice thinly and serve with Madeira sauce.